Source: E-Copy of book provided by publisher for an honest review. Samantha Silva’s Mr. Dickens and His Carol was a good way to kick off the holiday season. Silva’s writing took me back in time and right into the life of author Charles Dickens. His latest book is not doing so well and his publisher is threatening to dock his pay, bill collectors and family wanting financial help are knocking at this door, and his wife has just given birth to another child. To make things worse, he is being asked to write a Christmas story in a short amount of time. Charles is feeling a lot of things at the moment, but the Christmas spirit is not one of them. Especially with his wife Catherine’s holiday preparations costing him more and more money with each new decision she makes and his children with their wide eyes and innocence hoping for their father’s usual holiday generosity. Charles is indeed a generous man and does not like to say no to his wife or children. As a result, he knows he has little choice but to write the Christmas story, despite his initial refusal to do so. His temper is short, his family has deserted him as a result, time is running out, and writer’s block has set in. Taking to the streets of London, Charles walks into the night, hoping for inspiration. He finds it in the form of a mysterious woman in a purple cloak. Could she be his muse? With a bit of humor, the occasional name dropping, and a lot of atmosphere, Samantha Silva’s fictional account of how A Christmas Carol came into being was both compelling and inspiring. A Christmas Carol is one of my favorite Christmas stories, both in written and movie form. It’s a story that most people know and is very much a part of Western culture today. It’s message is timeless as is its impact. And while Silva’s tale in Mr. Dickens and His Carol follows a similar theme, it doesn’t quite live up to the original. But then, what book could, really? Still, I enjoyed getting to know Charles Dickens as a character and most especially Eleanor Lovejoy and Timothy. I wouldn’t have minded more time spent with them. I will admit that Charles’s obsession with Eleanor did give me pause, given he is a married man, his wife having just given birth to their child. And while I could see why Charles might be into Eleanor, I couldn’t quite see the attraction the other way around. Still, there is something about Eleanor—her mystery, her past, or perhaps her Timothy—that drew me to her just as Charles was drawn to her. And, of course, Timothy. In a story like this a Timothy is essential. I loved the historical tidbits Silva included about the real Charles Dickens’ life as well as the appearance of his “rival” authors of the time, William Thackeray and Wilkie Collins, for example. It was also interesting to get a close up of the plagiarism and pirating that took place during the time. Oh, and the fan and critic reactions! People were just as bold with their opinions then as now—only then they did not have the internet and so most of it came in person on the street. The ending is what really made this story for me, bringing it around in a way that made me appreciate the book even more than I might have otherwise. One thing is for sure. I hope to re-read A Christmas Carol soon. To learn more about Samantha Silva and her work, please visit the author's website. I don't think I've ever actually read the original so I might like this more than you did. Aside from the wonderful cover, I'm interested in this imagining of the famous story. And I also love historical tidbits about authors. Thanks for a great review, Wendy! Jenclair - I hope you get a chance to read this one. I am not a huge fan of Dickens the man, but I did enjoy this book. I've read that the Charles Dickens did have a mistress (although her name was Ellen) so perhaps Eleanor was a nod to that? Eustacia - Yes, it is perfect for this time of year, isn't it? I hope to get over to see your review soon! It's very possible that Eleanor could be a nod to Ellen. I know the other woman whose name I can't remember at the moment was definitely a real one from his past. This sounds like such an amazing book! 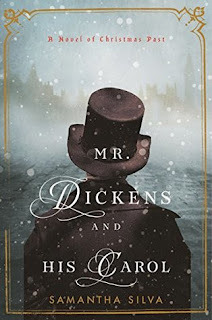 I love Charles Dickens as an author and I re-read his 'Christmas Carol' every year around December :) Need to check this one out. Jo - It is definitely worth reading if you get the chance! What a great pick for the holidays! I read The Man Who Invented Christmas which is about Dickens writing A Christmas Carol. I have set a goal to read more Dickens. I love Tale of Two Cities, Great Expectations, and A Christmas Carol so I don't know why I haven't read more. I just started David Copperfield. I am reading 3 chapters a night. I am pretending I am awaiting each new installment. I am going to get this book. Janet - Is that the one the movie is based on? I would like to read that one as well. I have only read A Christmas Carol and Oliver Twist by Dickens, both of which I love. I would like to try his other work at some point. This one sounds like a great read and I'm glad you enjoyed it, Wendy. Melody - Yes, it was a good one. Thank you for visiting, Melody!